The SDI® (Strength Deployment Inventory®) is a proven resource for improving team effectiveness and reducing the costs of conflict. It is the primary assessment of a suite of tools based on Relationship Awareness Theory® — a learning model for effectively and accurately understanding the motive behind behaviour. This self-awareness greatly enhances peoples’ ability to relate more professionally, communicate more effectively AND handle conflict more productively. Strength: Strength Deployment Inventory helps people identify their personal strengths in relating to others under two conditions: 1) when everything is going well, or 2) when they are faced with conflict. Deployment: Defined as moving strategically or to taking a position for effective actions. The SDI suggests ways that one’s personal strengths may be strategically used to improve relationships with others. Inventory: SDI is not a test where answers are “right” or “wrong”. It is an inventory for taking stock of motivational values (the basis for how you feel and act in different situations). It is a self-discovery tool. As a result, we are able to more effectively relate to them and better understand how they might respond. Being trained in SDI helps you chose from a range of behaviours and recognise what their potential impact might be. Click here to view a brief video overview of SDI. Strength Deployment Inventory (SDI) is a powerful, self-discovery inventory for enhancing your ability to transform your workplace, your relationships and your life. SDI assists people to appreciate diversity, communicate more effectively and handle conflict more productively. Unlike other personality assessments, the SDI goes beyond behaviour to identify the motivation behind behaviour — answering “why” individuals act the way they do. It becomes easier to accept another person’s actions when you understand their motives, intention and then their behaviour. 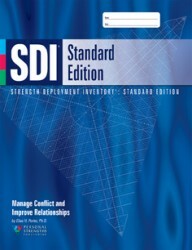 Plus, by revealing response to conflict, the SDI is actually two valuable assessments in one.Five formats are available to fit any training situation: SDI Standard Edition, SDI Premier Edition, SDI Component Edition, SDI Easy-Read Edition, and Online SDI Standard Edition. 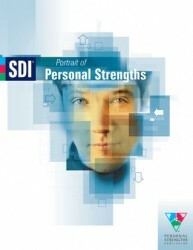 The Portrait of Personal Strengths is a practical and fun learning resource that compliments and extends SDI insights. 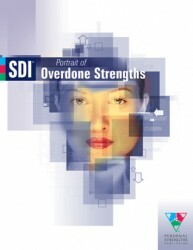 It is completed by sorting and prioritising 28 strengths/behaviour traits that you use when relating to others.Used in conjunction with SDI, it quickly helps people to understand the strengths they most and least frequently use when relating with others, giving essential insights into development opportunities for individuals and other areas such as team norms, culture and strength gaps. It’s “sort and stick” format makes it an enjoyable break from traditional assessment tool formats. With the Portrait of Overdone Strengths, you rank how frequently you overdo 28 different strengths/ behaviour traits. The insights gained from this Portrait can reveal potential sources of interpersonal conflict. Participants who use this portrait report that they make more informed behaviour choices by recognising when they are about to overdo a strength. When the costs of overdone strengths become clear, participants feel more empowered to borrow other behaviour and be more effective. It’s useful for any situation where people relate to each other, such as in the community, the workplace or with family. Available in paper or online.